Remember this post where I helped a grandmother make a chirstening gown? Well she was gracious enough to send me pictures of the gown ON the baby. Now the gown is gorgeous, but the gown on the baby is over the moon. 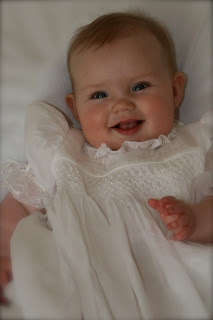 If you can tear your eyes away from this gorgeous child, notice the beautiful smocking, precious teeny tiny piping, great pintucks and lace frill around the neckline. The fabric she used is my absolute favorite, silky voile. This gown by this picture has been washed a couple of times and yet the fabric keeps it filmy floaty appearance. And just one more to leave you with a smile. She is going to be a little heart breaker once she is a teenager. Beautiful baby. Beautiful gown. This grandmother considers herself a beginner, I would beg to differ, but if you take a project slowly, ask for help when needed, start with the best materials you can afford, you too can create a wonderful confection. Wow, she is beautiful in your lovely gown. Doesn't that just make you grin from ear to ear? You have given this child something to cherish for a lifetime, and how nice that they sent you pictures. Stunning gown, and beautiful pictures. 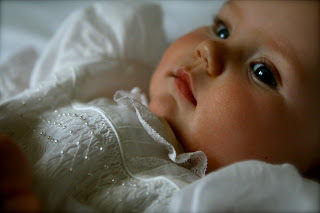 this sweet cherub and the gorgeous gown indeed makes it hard for me to tear my eyes away!! what breathtaking beauty in both!!!! Wow. 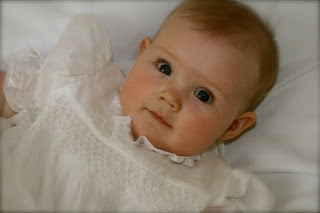 Yes, beautiful baby but beautiful gown. Now you are making me want to try to make one. I am just a beginner though so I am sure I could not do something that beautiful. Maybe one day. Your quilt should be on the way in the next couple of days. Did you read on my sidebar about Granny's perfect quilts? If not, you will be blessed. Another blogger wrote this because as far as the sewing Grannys quilts are not perfect but they are perfect for certain things. 96 years old and still quilting is amazing to me. Thank you again. That baby looks like a china doll. Plus the dress makes her shine even more. Love it! That baby is so beautiful she almost doesn't look real. It really is hard to look away from her face to observe the gown details! Oh my goodness, what a doll baby! What a beautiful baby -- and look at those eyes! Beautiful gown, too! You are a fabulous mentor, Martha! WOW! That baby is almost more beautiful than my children were when they were born . . . . . almost. She did an excellent job on the dress too! Certainly doesn't look like a beginner's work to me! Oh, Martha, you are so sweet and make my heart so thankful. Thank you for making this possible. Really, really thank you. Hugs!